"The dry long film from Codonics provides the orthopaedic surgeon the perspective and confidence in their measurements and angles, lost with the minified image. It is the perfect solution for our orthopaedic needs." In orthopaedic medicine, the ability to capture true-size images is essential. At Hospital for Special Surgery (HSS), an elite medical center, pinpoint accuracy using definitive tools enables surgeons to diagnose and treat delicate spinal and potentially debilitating leg conditions with optimal success. The importance of printing true-size images of spines and long bones came into sharp focus earlier this year when the hospital, a leading orthopaedic and rheumatology center located in New York City, replaced some of its existing dry imagers with a series of Codonics Horizon® XL Multi-media Dry Imagers - the world's only imager capable of printing digitally stitched images onto one continuous piece of dry film up to 51 inches in length. The Department of Radiology and Imaging has installed seven Horizon XL imagers in radiography rooms throughout the extensive department over the past several months. Radiologists and orthopaedic surgeons are pleased with the results. "Dr. (Helene) Pavlov, our radiologist-in-chief, has carefully examined the film quality, and she believes it's outstanding," said Edward White, Assistant Vice-President for the Department of Radiology and Imaging. "Our surgeons are the ones who actually look at the images on 36" or 51" film, which in the digital world has not been available until now, and they recognize the quality." Established in 1863, HSS is a world leader in musculoskeletal medicine. Performing nearly 18,000 orthopaedic surgeries per year, the hospital was the site of the first total knee replacement and a pioneer in the development of minimally invasive spine surgery techniques designed to eliminate the need for spinal fusion. HSS has been named by U.S. News & World Report as the top center in the Northeast for orthopaedics and rheumatology for the past 16 years. A key component of the hospital's longstanding success is the Radiology Department, led by Helene Pavlov, MD, FACR. She and her colleagues - 12 radiologists and up to seven fellows - complete an estimated 180,000 imaging exams per year. Important to their success is the Codonics Horizon XL, which produces hard-copy images for radiography exams, occasional CT studies and special procedures, including myelograms and arthrograms. The department "discovered" the Codonics imager when the system was shown during the Radiological Society of North America (RSNA) Scientific Meeting in Chicago. At that time HSS was not capable of digital images on 36" and 51" film. Instead, it was minifying images to fit onto a smaller 14" by 17" piece of film. If a physician wanted a true-size image, the image had to be acquired on a film/screen cassette combination and developed in the dark room, the traditional non-digital radiographic process. As a secondary option, surgeons often simply evaluated and diagnosed patients from images that printed on a smaller-than-true-size image. They believed that evaluating minified imageswas error prone. They needed another solution. Codonics solved the dilemma. Following the 2005 RSNA meeting, HSS conducted intense and quantified testing. Once performed and satisfied, HSS had three systems installed. The immediate, overwhelming response from physicians on the quality of the images and the improvement in the ease of diagnostic evaluation led to additional purchases. Within a week a fourth system was added, then three more during the following months. A total of seven are now in full operation. Now, surgeons can view true-size images of complete spines and limb lengths from hip to ankle on film more than four feet in length. This reflects the preferred practice of viewing, much the way x-rays of the hand, foot and other areas of the body are viewed-in true size. "Codonics came in, we did measurements on skeletons and validated them. Dr. Pavlov reviewed the images, did measurements and confirmed that we could validate against conventional images of that same skeleton," White said. "The Codonics images were exact. When we showed our surgeons a conventional image and a Codonics digital image side by side, they found that their perspective was intact and they no longer had to be concerned about errors." The exclusive Horizon XL model is a compact imager that instantly delivers images on true-size diagnostic film for templating for use within the operating room. With the XL imager, post procedure images can be printed and verified before the patient leaves the clinic or center. The system's 14" x 36" and 14" x 51" long film enables true-size images to be printed onto one continuous piece of film, then folded to 14" x 17" for insertion into a standard-size film jacket. 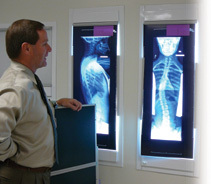 Key uses of the imager include facilitating evaluation of the entire spine for scoliosis, including idiopathic scoliosis and kyphosis - a curvature in the sagittal plane of the body with the apex of the curve directed posteriorly - and the entire leg from pelvis to ankle in order to determine leg length. The predominant procedures are for limb lengthening or correction of angular deformity. The Horizon XL also prints flawless images on clear and blue film, grayscale paper, and color paper in a variety of standard sizes. Specifically, it is capable of generating 14" x 17" and 8" x 10" blue or clear film, low-cost grayscale paper prints in 14" x 17" and 8.5" x 11", plus color in 8.5" x 11". According to physicians, the long film is perfect for evaluating scoliosis, long-bone, pediatric and adult spines, while the paper, too, offers huge conveniences. Codonics' cost-saving DirectVista® Grayscale Paper can be read in room light and is a great alternative to film for several applications. To date, HSS has presented images on film. However, White expects his department to begin presenting on paper in the near future, a capability that will add considerable convenience to the way surgeons interact with patients and their colleagues. As the department goes filmless, physicians will be able to explain diagnoses to patients in room light and share information with referring physicians without having to access a view box. The implications are far reaching, including a projected cost savings over film of up to 65%. "We certainly intend to begin using that capability in the near future, and it will provide us with cost savings in addition to what we've seen so far," White said. There have been other benefits. "The system's small footprint saves the department precious space, the cost of operation is minimal, little servicing is required, and Codonics' support is timely," White said. Perhaps most important, physicians are viewing true size 36" or 51" digital, diagnostic-quality images never before available, almost effortlessly, using the XL. "The Codonics imager has proven essential for pre-surgical planning and post-op so that they can track the progress of the patient," White said. "We didn't sacrifice any image quality to use this system. The surgeons in particular are satisfied with the accuracy they're getting for their pre-surgical calculations and decisions based upon that image, and they've been very accepting with this transition from minified images." He added: "Remember - miniscule measurement deviations using small reference points can result in significant miscalculations when the image is scaled. Where leg lengthening is concerned, that can be profound." Certainly, any measurement error is significant. At Hospital for Special Surgery, the Codonics Horizon has virtually eliminated the possibility of error, creating a new gold standard for measurement - one that translates to an important reality: an elite orthopaedic center has become even better, thanks in part to Codonics. "The possibility of error, while remote, is now even less likely," White said. "That has given our physicians added confidence as they diagnose and treat their patients. I'd say our ability to acquire and print images in true-size contributes to our patient satisfaction, and we owe some of that success to Codonics."